University hiring: If you didn't get your Ph.D. at an elite university, good luck finding an academic job. The top 10 universities produce three times as many future professors as those ranked 11 through 20. Above, Harvard University’s Kirkland House. Photo illustration by James Emmerman. Photo by William B. Plowman/Getty Images. At first glance, this hiring system may be seem like good news for college students at least. Whether you go to a prestigious or less prestigious school, you’ll be learning from the best of the best. But the situation isn’t so rosy for the students who dream of making ground-breaking discoveries as faculty members themselves. The elite schools are producing so many job-seekers on the faculty market that they can’t hire them all themselves, so the vast majority end up at less elite schools. That means that even if you manage to be admitted to a Ph.D. program at a prestigious university, the chances are slim that you’ll stay at that university, or even a similar university, when it’s time to get a faculty job. In fact, after graduating with Ph.D.s, only about 10 percent of faculty move “up” the academic prestige hierarchy as defined by the Science Advances study (with “prestige” being determined by the university’s ability to place faculty at the widest variety of other institutions). Most faculty instead slide 25 percent down the scale. At the same time Oprisko was struggling to find work, he says his Ivy League political science colleagues, like a friend of his at University of Pennsylvania, had no problem landing elite postdocs and professorship opportunities. “He’s a wonderful guy, but he hadn’t actually done anything,” Oprisko says of his friend from UPenn. And Oprisko doesn’t think he’s imagining this bias against him; he says he’s been told by his mentors that, “There is an imprimatur of being ‘Ivy’ all the way down. You’re the cream of the crop if you can claim to be of a certain status from bottom to top.” He’s stopped listing his master’s degree from Indiana State on his résumé. He’s been told it’s better to have it appear as if he was doing nothing at all during that time than to be associated with a low-prestige school. Oprisko’s experiences inspired him to research faculty hiring on his own. In 2012, he conducted a review of the 3,709 political science professors who were then employed by Ph.D.-granting universities and found that just 11 schools had produced 50 percent of the total. 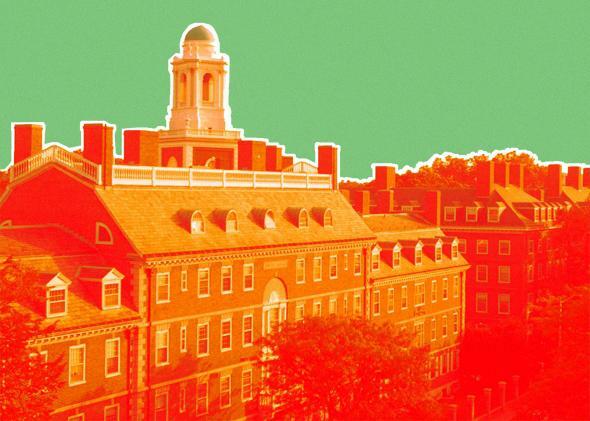 Harvard, at the top of the list, was responsible for 239 of the professors. Purdue, on the other hand, was responsible for 10 of them. These facts bring up an uncomfortable question for nonelite universities, which account for the large majority of all Ph.D.-granting institutions. Both Clauset’s and Oprisko’s research suggests most universities are not very successful at generating professors, and most people only get doctorates because they intend to go into academia. Should these lower-prestige institutions even bother granting Ph.D.s at all? Clauset’s findings suggest that upward career mobility in the world of professors is mostly a myth. Yes, being a professor isn’t simply about making it to the top of the heap. But imagine if you had to start your chosen profession knowing that unless you were among a select few, you might never land a job. Of course, some people do manage to move against the current. Who are they, and what makes them special? To find out, Sam Way, a doctoral student in Clauset’s research group at University of Colorado–Boulder, mined the information on the 16,000-plus faculty members in the study, looking for those who achieved the greatest positive difference between the rank of their Ph.D. institutions and the rank of the universities where they now work. We then contacted a few of these standouts to find out what it took for them to move up the academic ladder. For starters, it took a heck of a lot of work. “I killed myself,” says one female business professor who worked her way up from a midlevel undergraduate university to a top-level faculty job. To get there, she labored so hard she alienated her fellow students, annoyed her academic adviser, and even sacrificed her health. (“Looking back, I must have been insufferable,” she says.) She requested that we not use her name or credentials, because she says some of her former colleagues are “weirdly conflicted” about her success—and her success in her field is so unique that even just revealing the universities she’s been associated with would give her away to her associates. It’s not clear how, exactly, to fix this skewed hiring system. There’s no central regulating body that coordinates hiring across institutions—and even if there was, it’s hard to imagine the elite universities, which often dominate conversations in the world of higher education, would support major changes, since they benefit from the current system where their students land the most, and best, jobs. History is full of examples of important discoveries that were slow to catch on because they came from academic outsiders, from continental drift to the origin of eukaryotic cells to the existence of quasicrystals. Thanks to the restrictive nature of the academic system there may be many more innovations that are languishing in obscurity, and they will continue to do so until our universities find a way to apply the principles of diversity they espouse in building student bodies to their hiring practices as well.